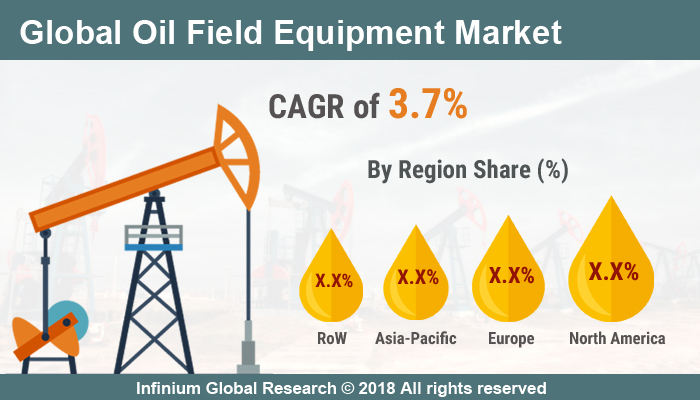 A recent report published by Infinium Global Research on oil field equipment market provides an in-depth analysis of segments and sub-segments in global as well as regional oil field equipment market. The study also highlights the impact of drivers, restraints and macro indicators on the global and regional oil field equipment market over the short term as well as long term. The report is a comprehensive presentation of trends, forecast and dollar values of global oil field equipment market. According to the report the global oil field equipment market is projected to grow at a CAGR of 3.7% over the forecast period of 2018-2024. An oilfield is a region with an abundance of oil wells extracting petroleum (crude oil) from below ground. Oilfield equipment including land rigs, offshore rigs, drilling equipment, production equipment, and more in a seamless, worldwide exchange. Oilfield construction depends heavily on oilfield equipment and the construction engineers need to have a complete idea of the equipment they are about to use. Oilfield equipment is often not only large but also in price and repair costs. Technological advancements in oil field equipment for improved recovery and better performance along with high production rate drives the growth of the oil field equipment market. In addition, growth in the oil and gas is anticipated to especially be strong in the developing countries where improving infrastructure will contribute to more drilling activity. Moreover, advancement in drilling techniques is further anticipated to boost the growth of the oil field equipment market. However, some of the oil fields are located far away from the readily available sources of electricity hence before starting to drill there should be enough amount of electricity to power the equipment. This, in turn, is restraining the growth of the oil field equipment market. Furthermore, the prices of crude oil are increasing and the upstream investment is projected to grow significantly and bring several projects online creating several growth opportunities for the key players in the oil field equipment market. Among the geographies, North America is the largest oil field equipment market. The growth in the North American region is owing to the high drilling activities to meet the energy demands along with the development of shale gas. Further, as the drilled wells are ready for production, the demand for oilfield equipment is expected to increase. On the other hand, the Mexican government has offered several blocks for exploration in the past few years. China is expected to contribute maximum towards regional industry growth in the future. Other countries including India, Thailand, and Indonesia are also expected to witness high market growth over the forecast period. The report on global oil field equipment market covers segments such as product and application. On the basis of product the global oil field equipment market is categorized into downhole drilling tools, fishing, and re-entry, tubular running services, cementing equipment and pressure control equipment. On the basis of application the global oil field equipment market is categorized into onshore and offshore. The report provides profiles of the companies in the global oil field equipment market such as Eni, FMC Technologies, Aker Solutions, Cameron International, Baker Hughes, Schlumberger Limited, Halliburton, Weatherford International, and National Oilwell Varco Incorporated. The report provides deep insights on demand forecasts, market trends, and micro and macro indicators. In addition, this report provides insights into the factors that are driving and restraining the global oil field equipment market. Moreover, IGR-Growth Matrix analysis given in the report brings insight into the investment areas that existing or new market players can consider. The report provides insights into the market using analytical tools such as Porter's five forces analysis and DRO analysis of oil field equipment market. Moreover, the study highlights current market trends and provides forecast from 2018-2024. We also have highlighted future trends in the oil field equipment market that will impact the demand during the forecast period. Moreover, the competitive analysis given in each regional market brings insight into the market share of the leading players. This report will help manufacturers, suppliers, and distributors of the oil field equipment market to understand the present and future trends in this market and formulate their strategies accordingly.